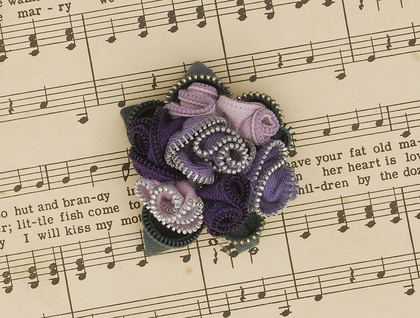 zippityDoodahs are quirky brooches and accessories handstitched from zips. they make a thoughtful gift for someone special, or the perfect finish to an ensemble, and have even been spotted on Shortland st. Lately I've been stitching little posies of mini zip flowers from my ZippityDooDah brooches. I was inspired by vintage victorian brooches and challenged myself to make perfect zip posies. This posey is made from delightlful miniature roses in various hues of purple and lilac. Some have silver teeth which add a little sparkle. A fantastic finishing flourish on a jacket, coat, hat or bag. Carefully handstitched from vintage zips, neatly finished on the reverse with a handstitched backing and brooch clasp.